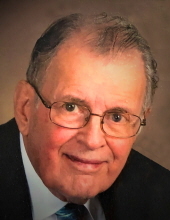 Paul A. Orefice, age 84, of Bethel Park, formerly Baldwin, passed away peacefully surrounded by family on Feb 1, 2019. Beloved husband of Eileen S. Orefice; father of Suzanne (Brian) Pfeiffer and Thomas P. (Susan) Orefice; grandfather of Andrew (Carmen) Pfeiffer, Rachel Pfeiffer, Sarah (Stephen) Trevorrow, and Alexander T. Orefice; brother of Lois Lehrman. Preceded in death by parents, Arden D. L. and Helga A. Orefice; and siblings, Thomas D. Orefice, Irene Vecchio, and Lorraine Silvester. Paul was a lifelong Sunday School teacher. He was recently a member at John C. McMillan Presbyterian Church where he served as a Deacon. Among is hobbies, Paul loved playing his trombone. Visitation will be held Tuesday, Feb. 5, 2-4 & 6-8 PM at the JEFFERSON MEMORIAL FUNERAL HOME, INC., 301 Curry Hollow Road, Pittsburgh, PA 15236. A Blessing Service will be held Wednesday, Feb. 6, at 10 AM in the funeral home chapel. Interment will follow at Jefferson Memorial Park. To send flowers or a remembrance gift to the family of Paul A. Orefice, please visit our Tribute Store. "Email Address" would like to share the life celebration of Paul A. Orefice. Click on the "link" to go to share a favorite memory or leave a condolence message for the family.